How to Identify Narcissism in Ourselves and Others and What We Can Do About It. For additional information about this book, visit the website www.youmightbeanarcissistif.com. Why is this relationship so hard? It is so invigorating to know that we don't have to stay stuck. Even if we're not the one struggling with narcissism, we can change the way we relate to the people who do. Find out if the stress in your relationships with family, friends, or at work is unknowingly caused from narcissism in yourself or others... Narcissism is actually much more common than we may think and, in reality, most of us have some of these characteristics. 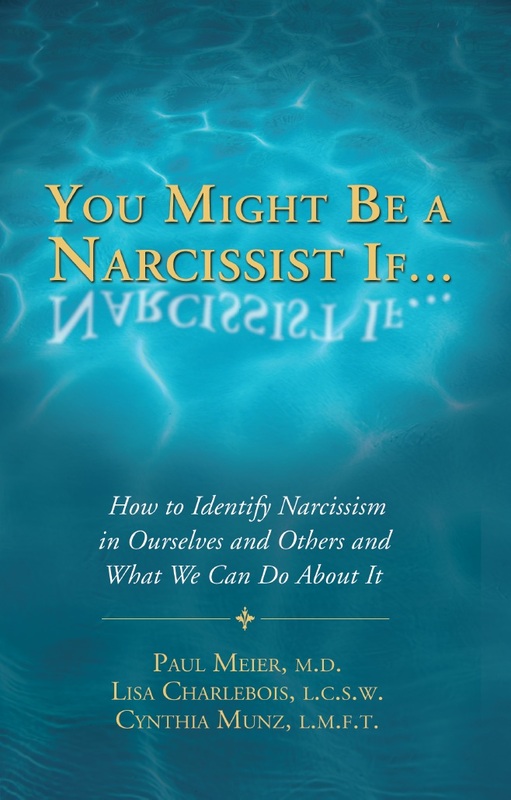 You Might Be a Narcissist If... was written by two psychotherapists and a psychiatrist with decades of both personal and professional experience with narcissism. It is filled with many interesting-to-read stories taken from the authors' or their clients' lives that clearly demonstrate examples of narcissism. A Narcissism Questionnaire and practical suggestions are given for dealing with narcissism whether it's in your spouse, a co-worker, or even yourself. Paul Meier, M.D. is a psychiatrist at the Meier Clinics in Richardson, Texas and is the author of more than eighty books, including Love Is a Choice, Happiness Is a Choice, Blue Genes, and Everything I Learned Since I Knew It All. He has appeared on hundreds of radio and television programs over the past thirty years, including shows with Oprah, Tom Snyder, Norman Vincent Peale, Joyce Meyer, Sheila Walsh, Paula White, and many others. He is also the founder of the national chain of counseling clinics called the Meier Clinics, a non-profit corporation. Cynthia Munz, M.S., L.M.F.T. became a Licensed Marriage and Family Therapist after completing her first career as a mom and homemaker. She was a staff therapist at the Meier Clinics for twelve years and is now in private practice in Placerville, California. Lisa Charlebois, M.S.W., L.C.S.W. was the director and a staff therapist at the Meier Clinics for fourteen years and is now in private practice in Gold River, California.